The highly anticipated sequel to the New York Times bestselling novel The Rosie Project, starring the same extraordinary couple now living in New York and unexpectedly expecting their first child. Get ready to fall in love all over again. Don Tillman and Rosie Jarman are back. The Wife Project is complete, and Don and Rosie are happily married and living in New York. But they're about to face a new challenge because...surprise! Rosie is pregnant. Don sets about learning the protocols of becoming a father, but his unusual research style gets him into trouble with the law. Fortunately his best friend Gene is on hand to offer advice: he's left Claudia and moved in with Don and Rosie. As Don tries to schedule time for pregnancy research, getting Gene and Claudia to reconcile, servicing the industrial refrigeration unit that occupies half his apartment, helping Dave the Baseball Fan save his business, and staying on the right side of Lydia the social worker, he almost misses the biggest problem of all: he might lose Rosie when she needs him the most. We met Don Tillman and Rosie Jarman in The Rosie Project. Don was looking for a wife; Rosie was looking for her father; what happened next was comical and magical. Well, Don and Rosie are back. They are married now and residing in New York City. Rosie is completing her doctoral dissertation while attending medical school and Don is working as a university researcher. Just when you think things are on an even keel in their relationship, they are thrown a curve . . . they're having a baby. Can Don overcome his regimented lifestyle to be there for Rosie? Can Don help to save his friends' marriage? Rosie has accepted Don with all his limitations, but is there an end to her level of acceptance? Mr. Simsion has crafted another wonderful story with The Rosie Effect. Just as with The Rosie Project, Don and Rosie appear to be at cross-purposes at times and this leads to a series of unfortunate misunderstandings. Although Don doesn't show his happiness or excitement about having a baby to Rosie, he goes out of his way to find them a larger apartment (which they share with beer dispensing equipment), researches fetal development, and even enlists his father to develop a soundproofed crib since their upstairs neighbor/landlord is in a rock band. Don is also on a quest to get his best friends Gene and Claudia backs together. 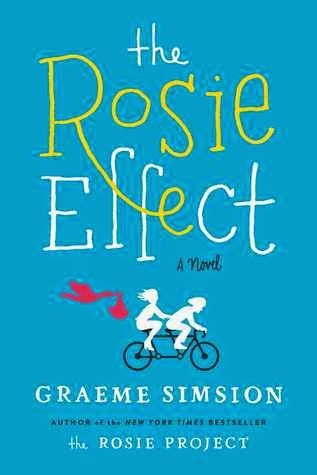 I found The Rosie Effect to be a delightful, fast-paced read filled with lots of joy, laughter, and some sadness (much like life). The joy and laughter often came from Don's machinations (give him credit for trying to help his friends as well as his lack of understanding that the wedding must be celebrated every year on the anniversary date) and exploits (the park arrest and subsequent attempt to obtain counseling were laugh-out-loud funny). The reader gets to see another side to Gene and he becomes more sympathetic in this story than in The Rosie Project (trust me and read the book to get the lowdown). Rosie is changing, partially due to the pregnancy and due to her struggles with her dissertation, medical school, and Don's apparent lack of feelings about the pregnancy and impending fatherhood. Mr. Simsion provides us with new characters, such as Dave the Baseball Fan, a judgmental social worker, and an aging rock-star. If you read The Rosie Project, then you'll want to run and get a copy of The Rosie Effect. You haven't read The Rosie Project?! What are you waiting for? Grab a copy today so you'll be able to follow Don and Rosie's story in The Rosie Effect! NOTE: You may want to read these books at home unless you don't mind quizzical stares from strangers when you're reading and laughing out loud in public. I recently reread The Rosie Project while waiting to be seen at a physician's office [no I didn't reread the entire book while waiting, just parts of it]. For a while I thought the staff was going to send me for a psych consult until I explained what I was reading. Fortunately the doctor's nurse had read the book and completely understood my behavior. Disclaimer: I received a copy of this book free for review purposes from the publisher via Edelweiss. I was not paid, required or otherwise obligated to write a positive review. The opinions I have expressed are my own. I am disclosing this in accordance with the Federal Trade Commission's 16 CFR, Part 255: "Guides Concerning the Use of Endorsements and Testimonials in Advertising."